After watching the refs botch Monday Night Football (Go Seahawks!? ), I was wondering if there's a way to quantify just how bad the NFL replacement referees are. One thing that stood out in the game was how many calls went the Seahawks' way on the final drive--which reminded me of the discussion of home-field advantage in Scorcasting. They concluded that referee bias is the primary driver in home-field advantage across sports. They even note that in the NFL from 1985-1998, the home team won 58.5% of the time, but after instant replay was introduced, the home team only won 56% of the games (1999-2008). If the replacement refs are much worse than the regulars, we might expect the home-field advantage to grow. My logic being, if the refs are botching more calls, those botched calls will tend to be in favor of the home team, that gives them an advantage, so they should win more. If you run that, you find out that we would expect 31 (or more) home team wins only 15% of the time. 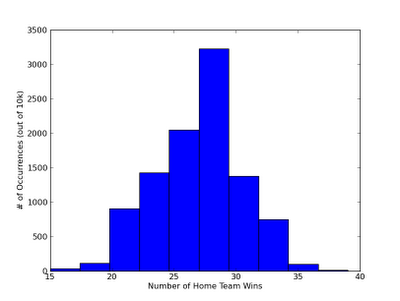 To turn it around: 85% of the time the home teams have fewer wins at this point in the season. We normally say something is significant when we reach the 5% level, so we're not there yet. If the home teams keep winning at a 65% rate (or higher) for 3-4 more weeks we should make it to significance! That's about the only reason I've found to root for the replacement refs sticking around--damned, scabs! The game between Green Bay Packers and Seattle Seahawks has finally exposed NFL’s fraud. 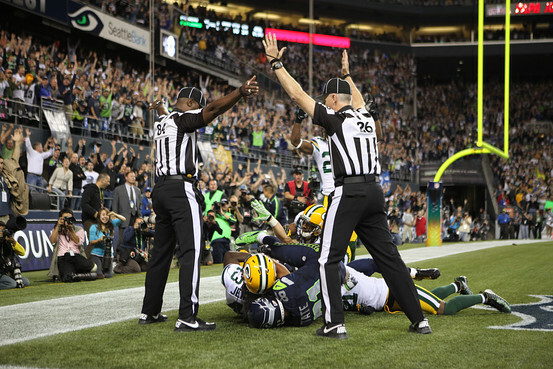 For months, NFL Commissioner Roger Goodell has leaded a strong public relations campaign designed to convince people that the replacement referees were qualified enough to be working in NFL games.However, the recent game held between Packers and Seahawks has shown every NFL fan that the referee decision regarding the game-winning touchdown was nothing less than a debacle. And at least for all Packers fans, it was nothing more than heart ache, since they lost the game 14-12 because of the controversial decision.